I may not be in the pursuit of a minimalist lifestyle. But just as I am shifting towards a more plant based diet for the sake of my health and the environment so too, do I pursue a shift towards minimalism. As you walk around your house, I am sure that if you take a moment to notice, you will be visually struck by how much clutter has collected. Clothing, receipts, letters. 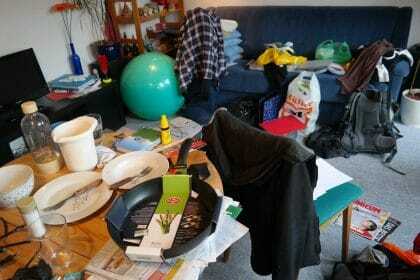 At times even calling it clutter may be too kind, it is just rubbish. The clutter hurts my brain. So much stuff, so seldom used, the clutter is stealing our attention. Consciously or only sub-consciously, it does not matter. What matters is that it does. If time is our most precious resource, attention is the currency we value it in. Clutter lowers that value, as it demands our attention. After a while you no longer own the stuff, it owns you. If you have to walk around it or make some other accommodation for it, then you are no longer in charge. The Japanese have a technique, popularised by Marie Kondo, where when you hold an object, ask the question – “Does it bring me joy?” . I take this question a step further, “Would it give me more joy to give it away than to keep?” Does it bring me joy, is limiting. Yes, I get a smidgen of joy, but would it give me more joy to give it to someone else who would really value it. Another popular technique to de-clutter is to pack everything away in boxes as if you were moving house (or better yet country, that might inspire you to give more away and pack less). Then only take out something that you use. After a set period, perhaps one month, but no more than three months, whatever is left in a box gets given or thrown away. Yes, maybe it might have been useful, but if you couldn’t be bothered to go to the effort to take it out of a box, maybe it can give more joy somewhere else. For my closet, I operate the “club” principle. One in, one out. Perhaps one in, two out would be better to cater for those that sneak in without me noticing. Challenge – As the seasons change, perhaps it is time for you to change with it. This week, find at least one thing to de-clutter in your life. You chose, perhaps your house, closet or phone (look out for the upcoming phone detox challenge). Do it by function, as in what it is used for, not by location. For example doing it by room often just results in moving it from one room to another, then back again. Even it is something as simple as de-cluttering the 7 bottle openers (or shoes or paperwork) you have scattered around the house. Reduce those selfish attention robbers. Value your attention, value your time.